3. [for other reference files such as media] automatic archiving in a special folder system by Hazel (see more details here). By the way, if you don’t know what Hazel (part of the Macademic Ninja Kit) is, listen to this episode of MacPowerUsers! This eye-opener, one of their best ever, not only changed the way I handled my own Mac, but also was among the strongest prompts to start this blog. My Hazel rules, essential for this workflow, were initially triggered by name modifiers (such as @a for reference files) and later – by OpenMeta tags. 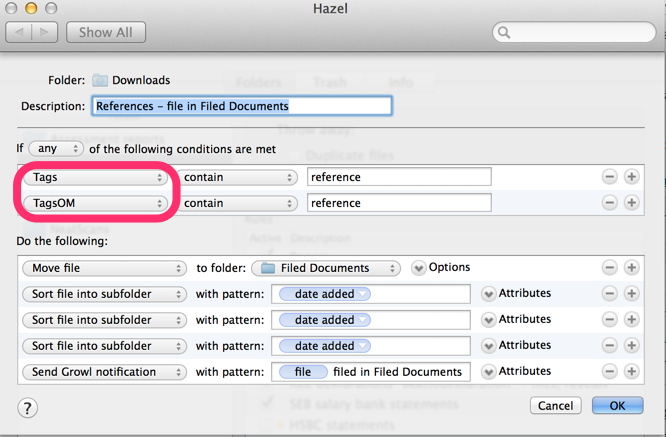 Any file tagged ‘reference‘ was automatically archived by Hazel in the relevant folder and any file tagged ‘papers‘ triggered another Hazel rule that opened it in Papers2. Subsequently Papers2 would match, rename and archive the document according to my preferences. (Newer versions of Papers2 can automatically import all files added to a specific folder and thus a Hazel rule is not necessary for workflow (2)). Of course, I use tagging not only to indicate how I want the document to be processed but also in order to easily find it when needed later. This entry was posted in Files, Tags and folders, Workflows and tagged Hazel, Mavericks, OpenMeta, Papers. Bookmark the permalink. While I like the niftiness of your workflow, I am not quite sure if understand what could be a good reason for sorting files based on “dates added”. Most files i like to add to my (filesystem-based) library have to be sorted based on topics, issues and subject matters. I simply see no way for automatization there. But maybe I am missing the point? Tom, documents which I import to Papers are stored in the subfolders corresponding to authors’s names. I save other reference content in date-based subfolders. I rarely use these subfolders for finding my references folder (in cases when I kind of remember that I received a file in October, but don’t remember anything else about it). To do proper search I use OpenMeta (now Mavericks) tags, which are based exactly on topics, issues and subject matters. Since one and the same file can relate to several topics tagging is more appropriate than folders for identifying and finding files. Check here for detail. DefaultFolderX is not needed to assign Mavericks tags. Every “Save as” dialogue in Mavericks has a field (just under the file name) for assigning Mavericks tags. Thus, if you use DefaultFolderX you can assign both Mavericks and OpenMeta tags. I have a feeling (but I would need to confirm) that by some magic/indexing my OM tags with time automatically become Mavericks tags. I know that it does not happen automatically though. In any case, I do not yet fully trust this feeling so I am now assigning Mavericks tags. As soon as I sort it out I will write a post. Concerning the tagging system – check some older entries. I think it is very much unique for every person. You should think what it is YOU will think about when looking for that file a year from now. It’s not so easy – you will need to try different approaches. In any case, my system is indeed hierarchical, e.g. I would tag a file as “energy:gas,regions:eu:sweden”. Such an organization allows you (a) to find such a file searching for “energy”, “gas”, “eu” and “sweden”. Moreover, if you want an overview of all your tags (e.g. in DevonThink or in Tags) all your energy-related tags and all your region-related tags will be located next to each other. This can help in cleaning up and improving your tag system. Thanks. Yeah, I started using tags when I updated to Mavericks. Before that, I was reluctant to use tags because I didn’t know whether Apple would break a third-party tagging system in an updated OS. I’ve read your posts on tagging, and I don’t seem to recall your discussing the hierarchical system you worked out. For me, the problem isn’t really finding the files (I used tags when I was using Zotero, and never had that problem). It is more that the tags begin to pile up, and it can become a bit unwieldy (At least my use of tags in Zotero was). I’m experimenting now with Sente and Papers, and I like the hierarchical system in Sente, as it seems a much more elegant than either folders or keywords/tags. Your tagging system looks pretty elegant as well, and I haven’t seen that before. I wasn’t sure whether a tag marked “energy:gas” could be found by searching either “energy” or “gas.” Now that I know that it can be, I’m going to have to rethink my tagging system a bit. (I’m still a bit worried that there might be three separate systems to work out: Sente, Mavericks, and, if I decide to pick it up as well. Devonthink). I’ve been debating picking up Default Folder X now that is part of the Productive Macs bundle, but I wasn’t sure whether it would allow you to assign Mavericks tags (I thought it only assigned OM tags, but I gather you can assign Mavericks tags as well). Anyway, thanks again for the blog. I’m going through a process of completely rethinking my workflow, and your blog has been an invaluable resource. Yes, DefaultFolderX preserves the OS ability to assign Tags + adds abilities to assign other attributes (and do some other cool things). Great blog. Thanks so much for all the smart ideas. Regarding your comment that Papers2 can automatically import all files added to a specific folder, could you explain how to do this? I cannot figure it out? Certainly. Go to Preferences, Library and then click on the option “Automatically import files added to these folders” and specify the folder. The same option is available in Papers3.